The birth of Lithuanian yellow, green, and red tricolor occurred during a drive-by other European republics to change their flags. The tricolor idea is usually attributed to Lithuanian exiles living elsewhere in Europe or in the United States during the 19th century. During the Lithuanian Vilnius Conference in 1917 two colors, green and red, were chosen for a flag, because of their prevalence in the folk art. However, the delegates did not like the design, as it was too dark. Therefore a special commission, composed of Jonas Basanavičius, Antanas Žmuidzinavičius, and Tadas Daugirdas suggested adding a strip of yellow (to symbolize the rising sun) above the green (fields and forests) and red (clouds lit up by the morning sun). The 1922 Constitution of Lithuanian Republic adopted this flag as a national. Discussions of the flag continued during the inter-war period, however eventually no changes were made. During the Soviet Era, the use of the national flag was prohibited and strictly prosecuted. In 1988, Lithuanian movement towards independence gained real strength. In the result, the Soviet Lithuanian Parliament recognized the tricolor as a national flag once again. 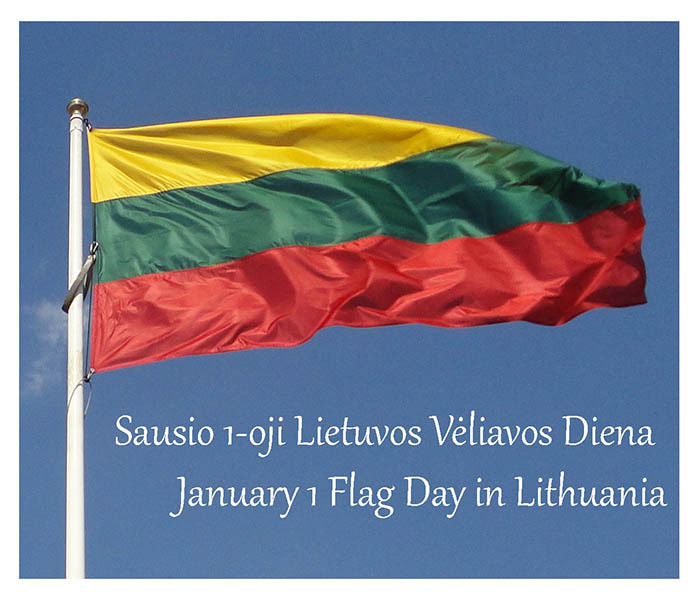 After independence from the Soviet Union, the tricolor flag was written into the new Constitution of Lithuania, which was adopted by a referendum in 1992.